Maldal, also known as Zacker, Reeezack or Keyluc is an email worm from 2001. Its third variant contained a prominent Christmas/New Year greeting. The attachment is named LucKey.exe. When the attachment is executed, it copies itself as LucKey.exe to the Windows folder and as DALAH.exe to the system folder. It may also copy itself to Drive A: with the name Malal.exe. Maldal mails itself to everyone in the Outlook address book. government will lead them to the hell ! 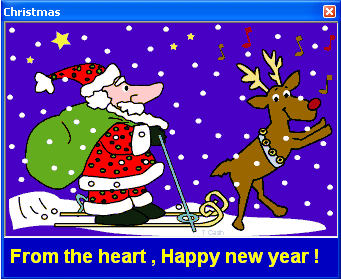 When Maldal.C is executed, it displays a window with a picture of Santa Claus with a reindeer and a new year message. It copies itself to the Windows folder as Christmas.exe. This file is registered with the local machine run key so it will run when the system starts. Maldal.C also drops a file named DaLaL.htm, which contains code to download another part of the worm, into the system folder. It attaches this file to the end of all files on all fixed and network drives with a .htm, .html or .asp extension. It deletes all files with extensions .lnk, .zip, .jpg, .jpeg, .mpg, .mpeg, .doc, .xls, .mdb, .txt, .ppt, .pps, .ram, .rm, .mp3 and .swf. After deleting the files, it creates copies of itself with names of all the files it has deleted with .vbs added to the name. The worm replaces the mirc.ini configuration file with one that sends a message to other uses of the same channel that contains a link to the infected webpage. The worm locks the keyboard and procedes to delete everything from the system folder. If the worm has been running for more than 30 minutes and was executed when the number= of seconds was 5, it will delete all files on the system, display a message and shut down the system. opinion about the war in the Middle East . Your voices may change the destny of two countries. Palestine , Israel and peace . These things are what you should write about. it will be shown in the main page. Know that your message will not be ignored. 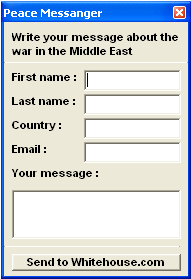 When executed, it displays a dialog containing fields where it asks for several pieces of data, including name, country and email. 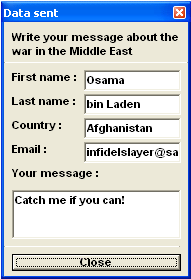 It also allows the user to write their own message. The worm did not spread very far or much. There were some reports of the C variant in Europe and the United Kingdom. It appears to have originated in South Africa, though it's unknown if it did any significant damage there. Message Labs reported 925 incidents on the first day of the .C variant spreading. Gergely Erdelyi, Katrin Tocheva, Sami Rautiainen. F-Secure Antivirus, F-Secure Virus Descriptions : Maldal.